Bride, The Princess — The majority of the cast of 1987’s romance classic The Princess Bride — including Billy Crystal, Cary Elwes, Robin Wright, Mandy Patinkin and Carol Kane — are set to reunite at the upcoming New York Film festival on the day the film is released on Blu-ray. The event should be perfect for die-hard fans who love the movie but have always wondered what the cast would look like as old people. You’ve never known the delicate touch of a woman? Me neither! 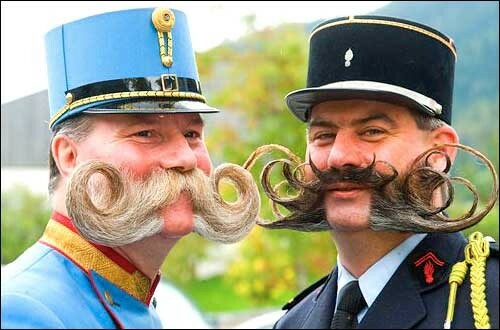 Championship, European Beard and Moustache — Competitors from all over Europe have arrived in Wittendorf, France for the first-ever European Beard and Moustache Championship, which honors impressive facial hair and those who grow it. Of course, this attracts top beard oils and shampoo producers. It’s a big month for Wittendorf as plumbers from across the continent arrive next week for the European Clogged Hotel Shower Drain Championship. Cyrus, Miley — Pop star Miley Cyrus — and her new blonde hairdo — are slated to appear on an episode of CBS’ Two and a Half Men this coming season in a role that allegedly demands her to be in various bikinis and lingerie. Because we all know that the key to staying hip, edgy and relevant is guest-appearance on Two and a Half Men. Turner, J.M.W. — Three artworks believed to have been painted by acclaimed British artist J.M.W. Turner were authenticated this week at the National Museum Wales after Turner experts deemed them to be the real deal, overturning previous assumptions that they were knock-offs. The three paintings — “Off Margate,” “Margate Jetty” and “The Beacon Light” — will return to exhibition on Friday. A fourth alleged Turner painting, “Kim Kardashian Rides a Stationary Bicycle,” was discounted as inauthentic and will remain off display.